Burns Jazz Bass Model Solid Body Electric Bass Guitar (1965), made in London, England, serial # 11837, sunburst polyester finish, African mahogany body, sycamore neck with rosewood fingerboard, black hard shell case. 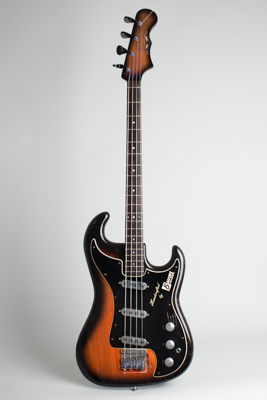 The Burns "Jazz Bass" (a name used without apparent concern for prior art from Fender) was designed as a mate for the company's most popular 1960's guitar design -- The Strat-like Jazz Split Sound model. A later addition to the original 1960's Burns London line (with production starting only in the second half of 1964), this is a relatively unsung Beat-Group era classic and a very stylish, great-sounding bass guitar. The Jazz Bass was Burns' mid-price 4-string instrument; professional class, but less expensive than the more dramatically-styled Bison and Shadows basses. It replaced the earlier 1962-4 Vista-Sonic Bass which had the same neck, electronics, and fittings on a much less Fender-ish body. The design of the Jazz Bass simply replaced the earlier rounded lump-cutaway style body with the new scooped-horn shape of the recently introduced Double Six 12-string. It also substituted a much lighter African mahogany for the very dense English sycamore used previously, resulting in a considerably handier instrument. The Jazz Bass has three of the original Burns Tri-sonic pickups hooked up to a rotary control giving four preset tone selections labeled Contra Bass, Bass, Treble, and the snarlingly out-of-phase "Wild Dog", which is of perhaps dubious utility on a bass guitar but entertaining anyway! The elaborate bridge has four individual saddles adjustable for height, intonation, and spacing, and must rate as one of the best such units of the era. The sunburst-finished neck has an unusual 31 1/2 inch-scale, halfway between the typical 34" Fender and 30" Gibson lengths. The neck itself is slim and comfortable with a slightly less round feel than a Fender. The medium scale gives a very fast and comfortable feel, but retains a more percussive edge than the standard 1960's 30" short scale. The very large sunburst single sided headstock -- later changed by Baldwin to a smaller natural finish double-sided design -- is equipped with large plastic-button VanGent tuning machines and a clear plastic "Jazz Bass" name plate. The red-black sunburst finish was standard for this model, and exceptions are nearly unknown. All the instruments from the Burns London period (1961-65) are interesting designs, quite well made, and this rates as a fine-playing bass guitar with tons of character and a very distinctive sound, used most notably by Troggs' bassist Pete Staples both live and on record. This model was continued by Baldwin (after late 1965), but after mid-1966 he mutated it into a more conventional 30" scale instrument, losing most of its unique character in the process. While no 1960's Burns instrument is common, this model is a considerable rarity particularly on these shores. Burns instruments were sold worldwide under the company's name, but very few made it to the US due to the English firm's lack of a distributor in this market. This "true Burns" example -- dated internally to early 1965 -- is one of the coolest and most unsung basses of the 1960's, "Handcrafted By BURNS London" in only very small numbers. A favorite around here and a cool 4-string connoisseur's delight! Overall length is 45 3/8 in. (115.3 cm. ), 14 in. (35.6 cm.) wide at lower bout, and 1 5/8 in. (4.1 cm.) in depth, measured at side of rim. Scale length is 31 1/2 in. (800 mm.). Width of nut is 1 11/16 in. (43 mm.). This is a fairly well-worn bass but remains original with no alterations or repairs. The finish shows the typical heavy checking common to later Burns finishes, with a lot of dings and dents but no large areas of wear or flaking. All hardware is original except the bridge cover and upper mute bar are gone, and several pickup mounting screws are newer. This is a VERY light instrument for its size, and a very good playing bass with an extremely wide sonic palette. Housed in a period (possible US-issue original) HSC with a replaced handle. Very Good + Condition.